Meet my new friend Mark Piotrowski. Mark is a High School art teacher, a talented muralist, owner of MarkedArts and a really cool guy! MARKed ARTs is a group of local Artists who are striving to bring public Art to the Great Lakes Bay Region and beyond! Made up of Mark Piotrowski, Adam Wernecke, Sean Gallagher, and Eric Larsen. Individually, they are all talented artists who pursue their own artistic work as well as public and private commissions. 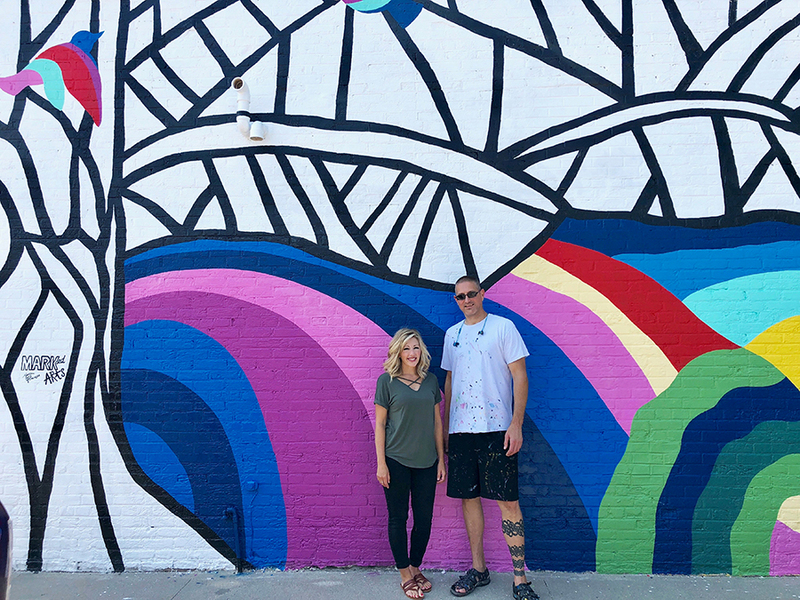 Together they have created murals for Uptown and Downtown Bay City and a huge project for the city of Midland. Currently, there are several projects in the works that will be coming to our area soon! I have had the wonderful privilege of serving on our community’s public arts committee for the past two years. I have loved working with individuals who truly care about our community and value the benefit art is to our well being. It is through this that I first learned of Mark. He is the amazing artist of the mural under the Business 10 Bridge. I love the way he uses color to create movement in his work. It’s been a dream of mine to have a mural on the side of our building. I’ve always thought what an amazing big blank canvas. I love public art and the way it gives us a shared experience. I love anything that puts a smile on your face and a pep in your step. I wanted our mural to do just that. I wanted something that would symbolize what we are passionate about and become a piece of art that would brighten the neighborhood we have come to love. Pause, connect, create and grow are some of the words we have settled on as some pillars we want to build here. Taking time to pause in the midst of our daily lives to notice and be grateful is a practice I personally have to be very intentional about. Connect & Create ... in the digital and fast paced lifestyles we all live the art of connecting over a cup of coffee, creating a business plan, crafting a project, making time for self care, dancing, exercising or receiving counseling... we all need space to connect in a place we can feel welcome and free to come as we are. We believe that creativity flourishes when we make time for the first two. Growth, we personally have experienced so much growth from being in community & learning from each other and we love watching others grow & fly! When I shared all of these ideas with Mark, he leaned in and said... "cool. This will be cool. I dig it". And then we went to work on drafting a design we felt would best reflect this vision. It was an awesome collaboration, Mark was amazing to work with... patient and didn’t seem to think I was too weird... for which I’m so grateful because I am a little strange. It has been a fun process and we hope that everyone has enjoyed the adventure and continues to enjoy the bit of inspiration it can give you as you drive, bike or walk by. We created stickers for you to take a little piece of the heart of Midtown with you. The proceeds of these will go to Marked Arts to further show our appreciation of the gift he shared with us. We would love for you to join us in thanking him.